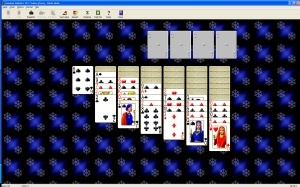 solitaire patience klondike freecell spider pyramid cruelnto one extraordinary game. With beautiful playing cards, full undo and redo of all your moves, automatic game saving, and complete statistics. Goodsol Solitaire 101 is a collection of 101 of the most played solitaire card games combined into one extraordinary game. With beautiful playing cards, full undo and redo of all your moves, automatic game saving, and complete statistics, Goodsol Solitaire 101 is solitaire the way it ought to be. Play many favorite solitaire games - Klondike, FreeCell, Spider, Pyramid, Scorpion, Canfield, Golf, Yukon and more! You can even submit your statistics to our web site to compare your scores with other solitaire players worldwide. Goodsol Solitaire 101 includes a unique new Climb Mode, where you play games in game number order for a cumulative score.